The first time I ever heard of a dongle was when it was used on a text processor called Wordcraft on the Commodore 8032. It was around 1980. We had three machines and had to share the dongle amongst us, which I thought was a pain so I had a look at the code. There was a scrambled bit of code which got unscrambled whenever the system checked for the dongle. So all I did was unscramble it, set the return value to true, jump to the end of the routine and allow it to rescramble. Then I found out what checksum it came up with and patched that in. The printer module also had to be patched because it checked the checksum. It only took 5 days to work that out the first time round. The second time round, it took 2 hours. About 2 months later, I saw an article in PC World that raving about how brilliant they were and how it would be an end to piracy. There was a similar article in a US publication. I wasn't exactly a top notch computer science graduate but it only took me five days part time. Did these reporters/computer experts even try bypassing the dongle or did they just copy each other? The moral is, if you want to implement a secure system with a dongle, get a crap programmer to implement it because they won't just have one routine to do the security - they will have several, all written differently so a cracker like myself can't just go in and clobber one routine to bypass the dongle. Anyway - that was two side stories. Wiki talks about the ones on the IBM PC but I remember using them in 1980, way before the IBM PC was even invented. Did wordcraft use them on the earlier versions or was it only on Version F onwards. Did dongles exist before then, say on the Apple ][ or TRS-80 or even CP/M machines? Did Wordcraft invent the word dongle? The oldest dongle like thing I own is a ROM board for the Apple II from 1978, where the whole PCB with all chips was cast in opaque thermoseting resin. This was ment to secure the software and disencurage any duplication. But tieing Software to hardware to restict usage is much older than microcomputers. Unique identifiers for machines and/or CPUs where common with mainframes. 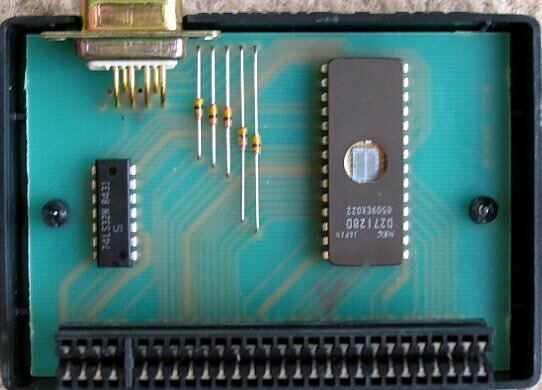 For /370 for example the CPUID instruction (X'B202' - STIDPin early manuals) delivered a dword with a 16 bit machine type and a 24 bit serial number unique for each CPU. This feature was available at least since 1970. Software manufacturers did modify their product before delivery to run only on certain customer machines it was sold for. Bottom line, dongling software isn't something invented by micros. The oldest (smart) hardware "dongle" I know of is from 1985 in the ZX Spectrum 48K. To curb Internet piracy and as a "collateral side effect" also having more 16KB (e.g. 64KB for the game), Mikro-Gen Ltd launched the game Shadow of the Unicorn with an external 16KB (EP)ROM board that mapped on top of the internal ROM address space. This game came with the Mikro-Plus interface, containing a 16K shadow ROM and joystick port. The ROM image can be found in the 'Additional material' section below. Fraser Ross created a Shadow of the Unicorn ROM Loader for the +2A/+3, which loads this ROM into RAM, allowing playing the game without the additional hardware device. In fact, I also heard early rumours of simple dongles which were no more than resistors in joystick, serial or printer ports...but never got more concrete data on them. Also, during the 80s, in the DOS and in the Amiga world, the concept of a "dongle" diskette as a low cost copy protection measure was pretty common. Usually the diskette was either damaged in a particular point which the software would try to read/format, with data hidden in non-standard sectors, and/or formatted in non-standard ways. P.S. I myself created similar diskette protections in assembly. I also dealt with dongles so far later on, and even had a demo kit based on RS-232 I think, that I misplaced or lost track of. I once broke also a dongle protection in the 90 in a DOS accounting program but it was rather simple... I debugged the (client) program to find out they just had a heavily protected interface module that hooked an interrupt, and upon called it set carry = 1 if the dongle was present, c=0 if not. I did not even bother to look at the TSR encrypted code from the vendor, I just wrote a replacement TSR that returned carry = 1 and presto, did not even need to patch the actual program, just load my 30 bytes TSR instead of the dongle vendor before invoking it. Wordcraft were the first ones to use it but they didn't create the word dongle. Not the answer you're looking for? Browse other questions tagged apple commodore-pet trs-80 or ask your own question.